Manchester Airport just can't stay out of the news! Recent stories have included a new British Airways recruitment drive, they're taking on 7000 new staff nationally, including 200 at Manchester Airport. As reported in a recent edition of "City Appointments", which I picked up in Manchester City Centre, they need ground staff, cabin crew, IT professionals, marketing staff, and people generally with language skills. And in Saturday's MEN, the front page carried a report about cigarette seizures by customs officials at Manchester Airport - they intercepted 13 million cigarettes from passengers trying to import them illegally for organised gangs. It was the biggest haul at any UK airport. With the price of a packet of 20 cigarettes currently well over three pounds, most of which goes to the Chancellor, it's a big temptation to try and bring them in. But all cigarettes seized have to be destroyed - no loss to me, I've given up! London is to get a � (one-way) connection to Manchester Airport - by train from Euston. The link will compete with the � fare from central London to London Heathrow on a new rail line. Meanwhile work continues on Runway Two, currently a wasteland of earthworks visible from across the fields near Mobberley and Styal. There was an aeronautical theme at a banquet last Friday at the Town Hall - I saw the invitees in formal dress gathering on Albert Square - it was for the Society of Experimental Test Pilots European Symposium, and the Duke of York, Prince Andrew, was the guest of Honour. Most distinguished aviator was Wing Commander Ken Wallis, MBE, who designed the autogyro helicopter seen in "You Only Live Twice". The Woodford Air Show will be taking place on June the 6th, I hope to attend. Also look out for aerial photos of Manchester, which I hope to take soon. Doctors at MRI were on duty recently when they were confronted with a problem: A patient had suffered a broken tibia and fibula, but before proceeding the doctor wanted to check that the emergency treatment wouldn't cause problems with treatment later. So they used a digital camera to take pictures of the injury and X-rays, and placed it on a hospital website. The consultant was called at home, viewed the pictures on his PC and gave his advice - all in the space of ten minutes. Paul Birtwistle, computer sytstems and research officer at MRI said the procedure has been used a number of times. A new series of 24 programmes on BBC2 has just started. The series is entitled "Made in Manchester" and is all about the city. 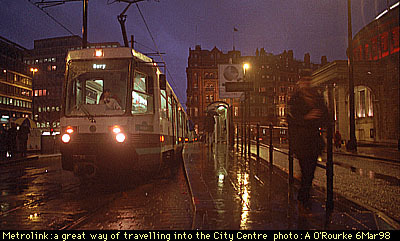 It's on as I write, featuring football, music and familiar-looking city centre views. 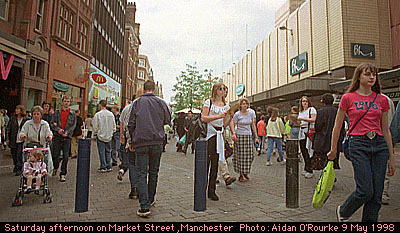 I've been looking at the new Manchester Evening News website, at www.manchesteronline.co.uk much improved from before, with new features and lots of shopping opportunities. But the news? Still only a fraction of what's in the newspaper. Hope you'll continue dropping in here for an independent view. Another website currently being advertised is to coincide with the "Queer Up North" festival, currently in progress. The "Streets Ahead" festival is also on at the moment. More info on festivals and events can be found at the City Council website. It was a glorious day on Saturday, warm, summery and carefree, but Sunday was drizzly and dull, with heavy rain late afternoon. Today has been overcast and showery. EWM temperature currently 50 fahrenheit, 10 celsius. TODAY I DISCOVERED QUITE BY ACCIDENT YOUR WEB PAGE ON MANCHESTER.YOUR PAGE IS BY FAR THE BEST THAT I HAVE COME ACROSS ON THE WEB ABOUT MANCHESTER.I CAN ONLY DESCRIBE IT AS REALLY BEAUTIFUL WITH SO MUCH INFORMATION. I WAS BORN IN THE WOODLANDS RD. AREA OF CRUMPSALL IN 1946 AND WENT TO TEMPLE PRIMARY SCHOOL ON BOYLE ST. OPPOSITE THE NOW BUS MUSEUM. IN 1967 I IMMIGRATED TO ISRAEL AND I HAVE BEEN LIVING HERE EVER SINCE. I LIVE ON A KIBBUTZ IN THE NORTH OF THE COUNTRY AND I AM MARRIED WITH 4 CHILDREN. I VISITED MANCHESTER LAST ABOUT 3 YEARS AGO AND OF COURSE THERE ARE SO MANY CHANGES TO BE SEEN. AIDAN, IF YOU WOULD LIKE ANY INFORMATION PLEASE CONTACT ME AND I WILL BE SO PLEASED TO HELP. ONCE AGAIN THANK YOU FOR SUCH A BEAUTIFUL WEB SITE. MELVYN. P.S. IF YOU KNOW OF ANY INTERESTING WEB SITES OF MANCHESTER PLEASE LET ME KNOW. Thanks very much indeed for the message. Try the websites above, and those above left. Oh, and congratulations on winning Eurovision - the singer seems more typical of Manchester's night club scene than Tel Aviv's. Thanks for the great website - I thoroughly enjoyed browsing through it! Well, you said if there's anything you can help with ... well, there is actually... I don't know if you would be able to get back to me on this, but (long story) I'm a German girl who lost her heart in England (to England) after studying there for a while and I would now like to live and work in the UK, Manchester specifically. Unfortunately, after much searching on the net I have still not been able to find out about Manchester newspapers with "Appointments"/"Classifieds" sections to help me find out about possible job opportunities. Would it be possible for you to tell me about some of them? I'd be really glad if you could. Also, is there a way of finding out about accomodation to share with young, funky and alternative people? Is there any kind of publication for that? Well, I hope I have not been too inconsiderate in asking for all this info..... Anyway, keep up with all the good work and I'll visit your site regularly from now on, I promise! Vielen Dank, Britta for the nice message. Manchester Online has "Looking for" features. Otherwise, try the MEN website. There are plenty of cars with German number plates round town, so you won't be far from your compatriots, but maybe you'd rather spend your time with Mancunians! Having just obtained the Internet I was appalled to see this issue of your paper which was obviously copied from the M.E.N. To start with the paper had deliberately misquoted me for its own political reasons. I presume from your name that you are Irish so cannot be unaware of the anti-Irish racism that is pumped out by the media and in Manchester by the MEN. It is therefore even more depressing that you have chosen to reproduce their text which passes for journalism. The aim of the meeting was to give Irish people in the city the opportunity to ask questions about issues that affect their lives. Clearly we were ahead of our time as our banned Sinn Fein speaker has been appointed to a N. Ireland committee and Gerry Adams is welcome in no.10! Simon McIlwhaine, Belfast-born Tory candidate for the Manchester Central consitituency expressed, outrage at the meeting, which was to have been held at the Quakers' "Friends Meeting House" building on Mount Street, off Albert Square. Questioned about the possible insensitivity of such a meeting, IBRG spokeswoman Bernadette Hyland replied: "The Manchester bomb has come and gone". The next day, the Quakers cancelled the booking. I gather stories from local media and pass them on without comment. Whether the MEN is anti-Irish is a good topic for debate. Anyhow, via the Internet you're free to speak your view directly to people all over the world, and they can also respond with their views to you, and I hope they will. MANCHESTER FORUM - ONLINE EDITION NOW READY! Click here for lots of articles and pictures on Manchester! Monday's Evening News front page featured the police nightime operation that took place in the City Centre at the weekend. They used roadblocks and other methods to carry out checks on suspected criminal elements. There has been much talk in recent weeks among insiders that organised crime in central Manchester is getting out of hand, and that the problem is spreading from the nighttime economy to the daytime economy. There have been reports of known drug gangs operating protection rackets, and flaunting themselves in city centre bars and clubs. In addition to this there has been the problem of thuggish behaviour, which has resulted in the deaths of several young people in the city centre in recent months. The police have been criticised for failing to deal with the problem effectively. Well it appears they have taken a first decisive step to fight lawlessness. The sight of uniformed officers on the streets of the City Centre, and going into clubs and bars was almost universally welcomed. Let's hope that the operation will continue, and that the Manchester economy will no longer be threatened by a tiny minority of thugs and gangsters. A woman from Wilmslow has been charged with the manslaughter of 26 year old mother-of-two Gina Armitage in Moss Side on Bank Holiday Monday. Carla Hunter of Racecourse Road, Wilmslow, was given bail of �,000, put up by her husband, a businessman. She has been ordered to keep out of Moss Side until she appears in court on 1 July. A man has been charged with the murder of the woman found near the Metrolink line in Collyhurst last week. 24 year old Martin Ward was charged with the murder of Janet Johnson and has been remanded in custody. A �0m sports and leisure project to be built in Leigh has been approved. The ski and leisure complex will feature real snow inside a dome. Sounds great, but environmentalists have protested about the complex, to be built near Pennington Flash. Stockport County Football Club were nearly wound up after a bill for �0,000 in unpaid taxes was received. The payment was made at the last minute and the winding up order was cancelled. Manager Brendan said the non-payment was an oversight and should have been sorted out earlier. I hope I don't get a tax bill for that amount.